Unlock the possibilities of powerful digital imaging and document solutions with Kyocera’s Copystar 2552ci. As the first in a series of innovative and efficient multifunctional printers, the CS 2551ci represents a new era for office technology. Within its sleek design lies shocking functionality: the printer, scanner, copy and fax machine puts elevated productivity right at your fingertips. Plus, customize the machine to fit your needs with a comprehensive selection of available optional features. When your workplace is equipped with the CS 2252ci, you’ll never want to leave the office – but with its mobile compatibility, you have the freedom to work anywhere. Upgrade your business with the Kyocera Copystar 2552ci. 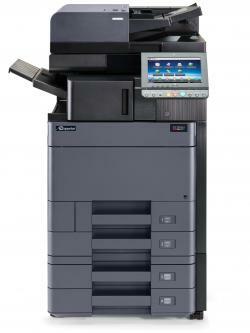 Designed to impress, the Copystar CS 2552ci is the ultimate color MFP for small businesses and distributed workgroups. As a flexible document processing hub, the CS 2552ci provides all the tools needed to easily and efficiently print, scan, and copy. Indeed, document processing is a breeze with a large tablet-like color touch screen, and intuitive feature selections that speed job turnaround. Whether running routine copies or scanning to a network folder, the CS 2552ci is the ideal solution for your growing business. Print in professional black-and-white or vibrant full color at speeds up to 25 pages per minute.